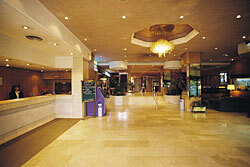 Tryp Diana Hotel near Madrid Airport, Spain. The TRYP Diana Hotel has many modern facilities. It is situated one kilometre from the Madrid Barajas airport, making it the ideal location for business or leisure travellers. Free shuttle is provided by the hotel. 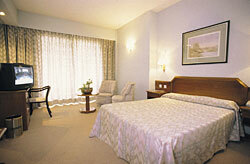 The hotel has a warm and welcoming atmosphere that emphasises friendly and hospitable service. The hotel has a pub, two coffee shops, Andalucian bar, discotheque, special grill restaurant, a terrace fountain bar and restaurant and a summer outdoor swimming pool. 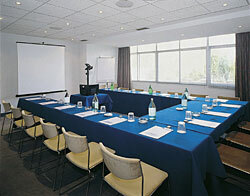 There are also conference facilities for up to 160 people as well as a comprehensive business centre. 304 rooms with fully equipped bathroom, air conditioning, interactive satellite TV, direct dial telephone, safe deposit box and room service (from midday until 4 pm). Free 24 hour airport shuttle (on request). Free transport to Ifema during major trade fairs. Coffe breaks, businees menus and wedding banquets. Location: Hotel Tryp Diana is located next to the Madrid Barajas airport, the Ifema Fairgrounds and perfectly comunicated with the city center by the rong roads M-30 and M-40. 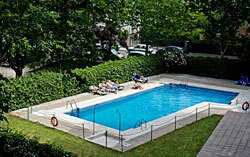 Hotel Tryp Diana offers outdoor swimming pool, terrace-garden and disco pub. By road: M30 and M40 exit Galeon street, towards Chamartin train station. Perfectly comunicated with the city center by the ring roads M-30 and M-40 and the buses 105 and 115.